"A classic appetizer made in just minutes in the Instant Pot®. 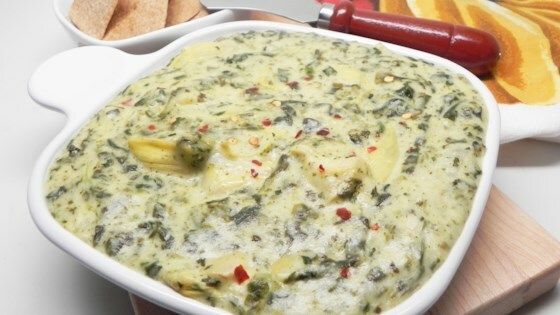 This has all of the creamy and cheesy goodness you'd expect in a spinach dip without the hassle." Combine frozen spinach, artichoke hearts, cream cheese, sour cream, onion, chicken broth, garlic, salt, and chile flakes in a multi-functional pressure cooker (such as Instant Pot(R)). Close and lock the lid. Select manual pressure according to manufacturer's instructions; set timer for 4 minutes. Allow 10 to 15 minutes for pressure to build. Release pressure carefully using the quick-release method according to manufacturer's instructions, about 5 minutes. Unlock and remove the lid. Add Parmesan cheese and Monterey Jack cheese. Whisk until smooth. Serve immediately. Cheesey, creamy and a family favorite around the holidays! Made as written. This was fabulously delicious and so easy!!! Great use for instant pot! Made on the stovetop- didn't take long at all. Would add more parmesan next time, but absolutely delicious!